Bluetooth Companion Scanners are ideal for those looking for an affordable implementation. A companion scanner works with a laptop, tablet, smartphone, or other device to collect data. These scanners are physically separate from their partner device. Instead, they use a Bluetooth connection to pass info. However, companion scanners do not have display screens to see during scanning. This means you need pairing with another device to view or edit data. These scanners are extremely lightweight, small, and durable. They are easily portable because of their small size. So, these are ideal for environments with sporadic scanning in multiple locations. Some Bluetooth barcode scanners have the ability to work offline to collect data. In this case, the device stores data until it reconnects and can upload data. Be sure to look into the functionality of different barcode scanners if this is necessary for you. One major advantage of these scanners is the price. Ranging from $200 – $800, it is comparable to the Sled Scanner. As a result, this scanner is an inexpensive solution for companies that are looking for convenient scanning. It allows employees to efficiently enter real-time data and access inventory information through their smartphone, tablet, or laptop. 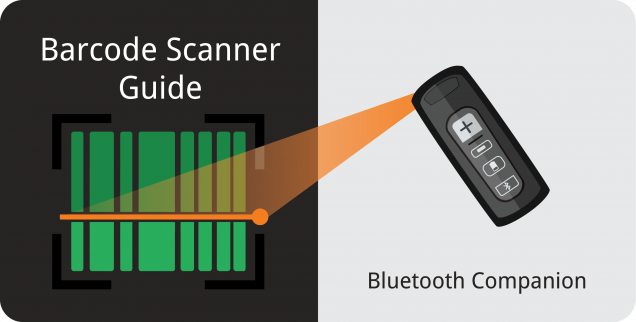 Although many barcode scanners have Bluetooth capabilities, these scanners rely on a Bluetooth connection to pass data to their paired device. This can be a problem in larger locations as the range of these devices is usually under 50 ft. But if the device you select has an offline mode and you don’t require up-to-the-minute data, this may not be relevant. Using these scanners requires a companion. Depending on your company’s current assets, this could affect the portability and cost. These scanners are ideal for companies whose employees have mobile access to their inventory system. These scanners can only push info to your inventory system with connection. In addition, there are no screens on this scanner. This makes it hard to confirm as objects scan without looking at the companion device. However, pairing these scanners with smartphones or tablets helps to alleviate this issue. But, needing both devices can be time consuming. Next week we will be wrapping up this series with offline data collection scanners. The links to the previous articles in the series are posted below. Are you interested in learning more about barcode scanning for inventory management? Click here to go to the Clear Spider webpage.